IC555 is making me happy. This tiny chip can be exploited in many ways. Here I am using Output pin3 and Threshold pin 6 to make an Audio oscillator. Another unusual way to design an Astable. In Astable design, the Threshold pin 6 is connected to Vcc using a resistor and the Discharge pin7 is connected to Threshold pin using another resistor. Both the combinations will be then connected to ground through a capacitor. Now see here. I am not using the discharge pin but using the output pin3 and Threshold pin 6 connected together using VR1. When the output goes high, C1 charges. When the out sinks, C1 discharges. The voltage variation in the Threshold pin makes the IC oscillating and sharp beeps will be heard through the buzzer. 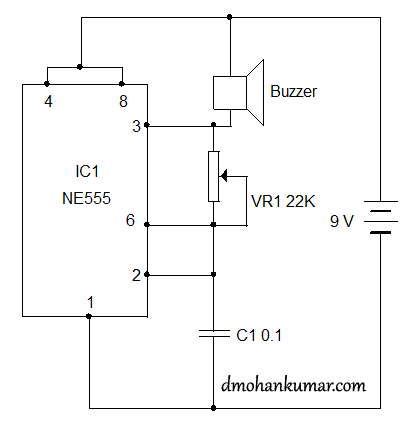 Use a continuous buzzer and 9 volt battery.